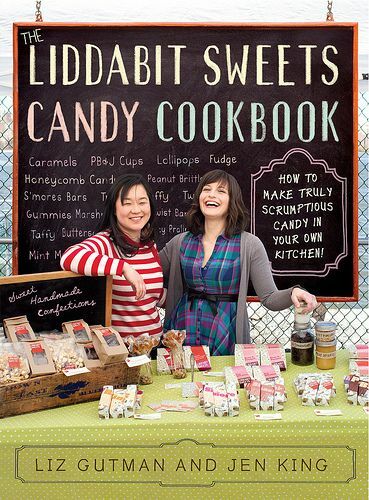 Today, Liz Gutman of Liddabit Sweets shares a recipe from their new book, The Liddabit Sweets Candy Cookbook. Jen and I have been in the candy business for several years now, and we made a little bit of everything while working on the recipes for this book – chewy, sweet Turkish Delight; fruity, bouncy Agar Jellies; classically tasty peanut brittle. They’re all wonderful and special in their own way, but having gone through all these different recipes, the ones we keep coming back to are the simplest ones. Dragées, which have likely been around in some form or other since human beings had access to sugar, nuts and fire, fit the bill nicely. Pronounced “druh-ZHAYS,” these are a perfect example of a treat exceeding the sum of its parts. Sure, nuts are great. So is caramelized sugar. So is chocolate. But together, they make something amazing. The fresher they are the better, so homemade dragées are a real treasure. I’ve heard dragées compared to Jordan almonds; but the similarities are mainly almonds and sugar. Where Jordan almonds have a thick candy coating and can be hazardous for sensitive teeth – I have many gold fillings myself, so I should know – dragées are crunchy but tender, with a thin caramelized shell and slight (or heavy, you decide) coating of chocolate, with just a little powdered sugar to keep them from sticking together. If you dislike the sweetness of the powdered sugar, feel free to use cocoa powder (we prefer Dutched), or a mixture of the two. Either way, you’ll end up with a whole heap of poppable, sophisticated, irresistibly yummy treats to set out at a party, snack on during a movie, or simply hide in the pantry for yourself. No matter what you do with ‘em, everybody wins. Keep in mind that it’s helpful for all the pre-chocolate-dipping ingredients to be warm, or at least not ice cold. This will buy you more time when you’re coating the nuts and separating them on the baking sheet. Also, it’s great to have a friend around when you’re coating the nuts in chocolate and dredging them in confectioners’ sugar. With one person to do the chocolate and one person to do the sugar, the whole thing is a bit easier. Toast the almonds: Heat the oven to 350°F/175°C. Lightly coat the baking sheet with cooking spray, and spread the almonds on it in an even layer. Bake, stirring a couple of times with a heatproof spatula or wooden spoon, until the almonds are golden brown and fragrant, 5 to 10 minutes. 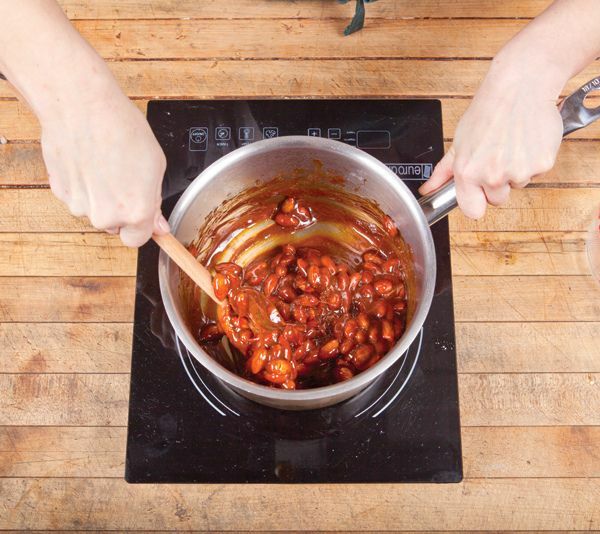 Allow the nuts to cool completely on the baking sheet, then transfer them to a medium-size bowl. 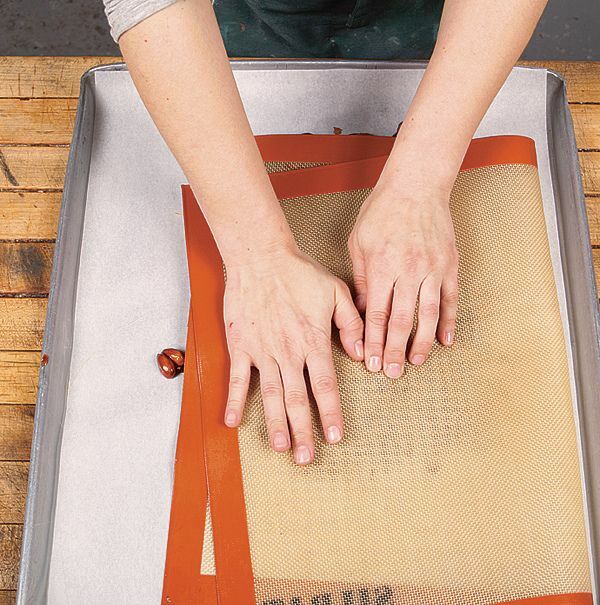 Line the baking sheet with parchment paper or a silicone mat. Combine the sugar, water, and cream of tartar in a small (2-quart) saucepan, and bring to a boil, uncovered, over high heat. Insert the candy thermometer. 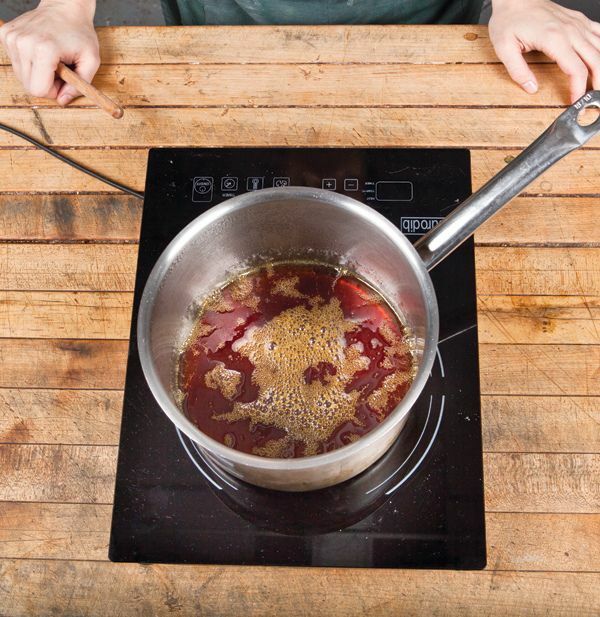 Reduce the heat to medium-high and cook, without stirring, until it reaches 280°F 138°C, 8 to 10 minutes. Add the almonds, stir them to coat, and cook, stirring frequently, until the mixture reaches 305°F/152°C (hard crack stage) and is brown and fragrant, another 5 to 7 minutes. Remove the saucepan from the heat. Stir in the olive oil, mix well to combine, and carefully pour the mixture onto the prepared baking sheet, scraping it out and pressing it into an even layer with the spatula. Wait a minute or two for the mixture to cool slightly. Then lay a sheet of parchment paper or a silicone mat on top of it and gently press down to even out the layer of almonds. As the mixture cools, carefully use your fingers to separate the almonds before the sugar sets up and becomes brittle. Allow the caramelized almonds to cool completely, about 30 minutes. In the meantime, temper the 2 cups chopped chocolate. 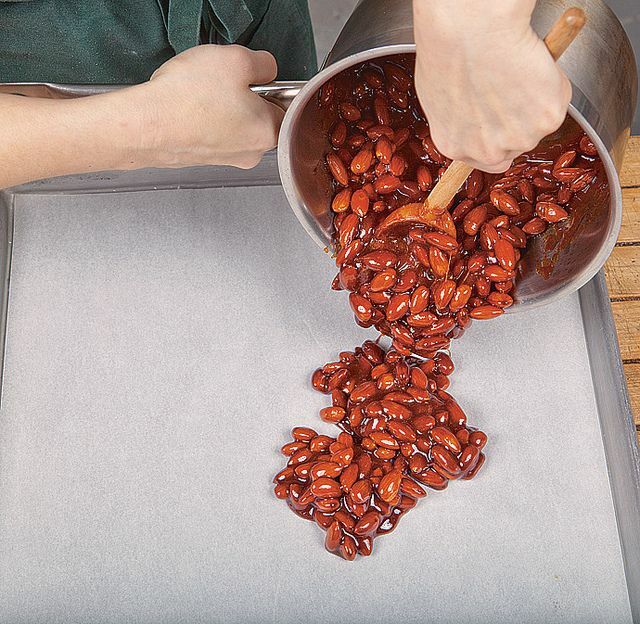 Transfer the almonds back to their bowl, and line the baking sheet again, this time with parchment or wax paper. Set up your dipping station as follows: Place an empty bowl in front of you; to its left, the bowl of almonds; to its right, the bowl of chocolate and a small bowl with the confectioners’ sugar. Set the lined baking sheet nearby. If you don’t want to get your hands messy, put on gloves, too. Place a few nuts and a spoonful or two of chocolate in the empty bowl, and gently toss the nuts with your hands until they’re coated with chocolate. 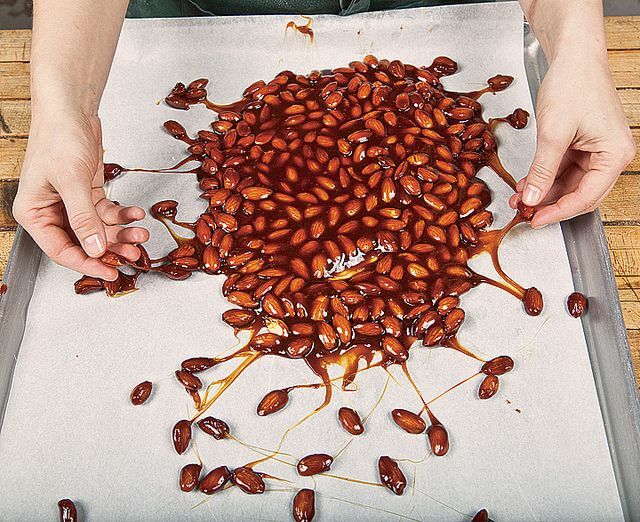 Drop the chocolate-covered nuts in the confectioners’ sugar, and toss to cover. Repeat this procedure until all the nuts are dipped and dredged, fishing the dredged nuts out of the sugar and placing them on the baking sheet every once in a while (this makes more room for the next round of nuts). Allow the dragées to set completely, about 10 minutes. Store the dragées in an airtight container at room temperature for up to 2 weeks. Microwave tempering: Put half the chocolate in a large, microwave-safe bowl. Microwave for 30 seconds, then stir vigorously. Repeat. As more of the chocolate melts, add unmelted chocolate and stir vigorously. Continue the process. The idea is to avoid heat the chocolate as little as you can and using residual heat to melt the added, unmelted chocolate. Lumps of unmelted chocolate should remain as you stir and only melt slowly into the mixture. The less you heat and the more you stir, the better. The cold chocolate comes tempered (crystalline) and it will help the melted chocolate harden in the same crystalline form. Have made these several times now and guests always go crazy over them. I made quite a few simplifications, as the recipe is quite complex. They didn't affect the results. - You don't really have to use blanched almonds but it is a better product, as the almond skins leave an annoying afterchew. You can blanch almonds yourself, but it's tedious. Cover with boiling water and let sit for 1 minute and no longer. Drain, rinse under cold water, and drain again. Let them sit for a while, then use your fingers to slip the skins off. If the skins don't pop off pretty easily, let them cool in the drainer for a while longer. Even better: use hazelnuts. Better flavor and easier to handle. - Instructions called for tempering the chocolate, but it seems like an unnecessary complication since they will be coated with confectioner's sugar. However, a microwave tempering is not difficult. - I reduced the amount of sugar to 3/4 cup because with less candy, the nuts are evenly coated and a lot easier to break apart. I also added 1 T corn syrup. - There is a lot of leftover chocolate in the original recipe. Original recipe called for 2 cups of chopped chocolate (about half a pound). This needs to be checked next time but I think 1 1/2 c will work (about 6 oz). I made these dragees from this cookbook last week! I made the Hachi Machi version with cocoa and cayenne pepper. I have to admit, it's pretty complicated (do you really have to temper chocolate that is hidden? I did, but I wonder) and I highly, highly recommend wearing gloves to pull the nuts apart so you don't burn or cut your hands, no kidding! I made these to give away but I keep stealing them--they are really delicious and addictive. I'm starting in on Liddabit's chocolate salted caramels and just finished their salted caramels yesterday. Nice, detailed instructions and tips--well done! Before this book gets beat up, it's time to return it to the library and get my own copy, as there are many more candies I'd like to make (beer and pretzel caramels, fig and ricotta caramels, etc.). You're right about the little balls, hardlikearmour. M&Ms are another other example. Jordan almonds are too. Dragées are just little candies with shells. 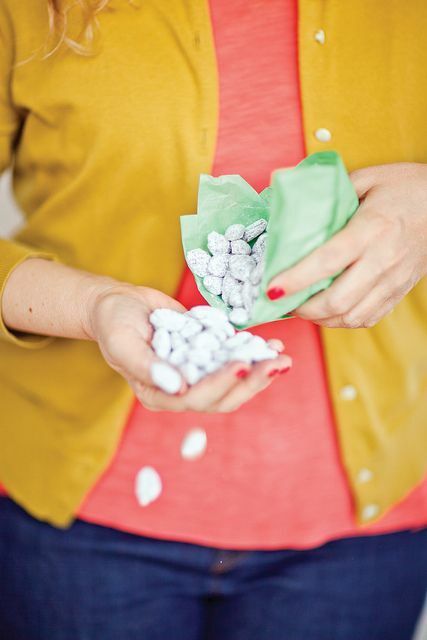 But these Liddabit Sweets dragées look especially delicious and fun to make. I've always thought dragees were the little silver and gold candy balls used in decorating cakes and cookies. Your version sounds FAR more delicious!